First Things First: What Type? Stand up paddle boarding, or SUP, has seen an explosion in popularity over the last decade. Since boards of all shapes, sizes, materials, and styles are available, the question becomes: what is the right SUP for you? Before going into the various sizes and materials, it is important to decide what you are going to use the board for. Each board has its specialty and ideal environment, so picking the right style will give you the best paddle boarding experience. Keep in mind, however, that many boards can be used for multiple types of activities, and people often use one board for all bodies of water and ventures. With that said, I will guide you through the main kinds of SUPs, starting from the most basic and beginner to the more advanced models. For those of you who like to stay dry, this is the board for you. All Around boards are very stable, making them ideal for beginners and experts alike, granting you more time paddling than swimming as you learn to use the board. They are also the most common, since they can be used in virtually any body of water, (though flatwater locations, such as lakes, are recommended). Do you have that need for speed? This board is built for just that. Slightly more difficult to use than the all around, touring SUPs are a great endurance workout. They are best used in flat water locations: lakes, open ocean, and bays. This board is for the intermediate or advanced, as it is much less stable than the all around board. It is also typically shorter than the all around board, but we will go into more depth about size later. As the name implies, it’s ideal for paddle surfing. So if you’re stoked for some cranking waves, this is the board for you. The golden sun rises over the rippling river as you do your daily yoga on this board. The most stable of the mentioned boards, this one is perfect for exercise with its wider deck. While there are many other types of boards, with specialized uses, like fishing, these are the most common. The next factor for the perfect board is size. 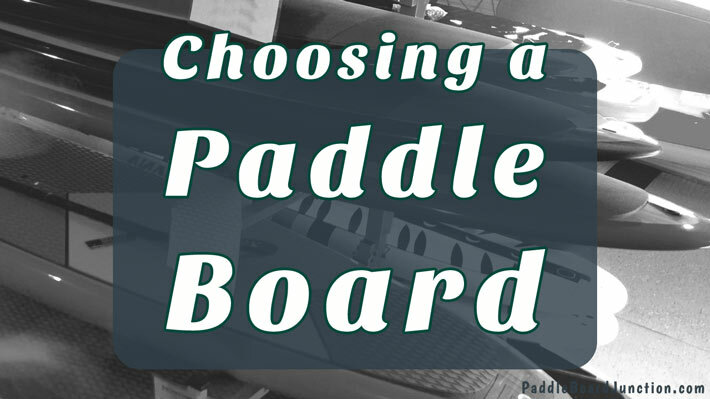 Once you have decided on the type and size of paddle board, the next question is what the board should be made of. Both solid and inflatable boards have their own merits, but which is the right one for you? Solid SUPs are made from a wide range of materials: wood, kevlar, epoxy, fiberglass. More durable and stable in rougher waters. When choosing your paddle, it is important to check the three major parts: the handle, the shaft, and the blade. Handles come in two different styles: “T”-shaped and “ball” / “ergo” -shaped. The “T”-shape is occasionally preferred among riders in rapids and surf because it is easier to get a tight grip, with a smaller chance of losing the paddle in the rougher waters. The “ball” or “ergo” -shaped handle is popular for calmer waters, but really has become the industry standard for SUP handle grips. And as you encounter all the different paddles out there you’ll naturally discover that there are paddle handles that merge the two distinct styles. The main difference between the various shafts is the material used to manufacture them. Wood: Has a warmer feel, lightweight, and the most aesthetically pleasing of the materials. Carbon Fiber: The strongest, yet lightest. More expensive, but worth the price if you are in the water for long distances or for a long time, as it causes the least arm exhaustion. Aluminum: Less expensive than some of the other materials. However, it is heavier and has a metallic coldness. Blades vary in size. Smaller blades are preferred for surfing and require less power and strain on the arms to paddle. Larger blades are more powerful, but not recommended for beginners, as they can cause shoulder pain. The size of the paddle will depend on your height and the kind of paddling you intend on doing. Racing: 10-12 inches taller for the most powerful strokes. When looking for the right paddle board, there are so many factors to consider, from type to size to material, etc… but finding the right board for you will give you the maximum enjoyment from this wonderful sport. Happy paddling, folks.